Was the rebound too fast? That’s a fair question. From our perspective, the jump was fast and is not likely sustainable at that pace. The gain since the December 24th low exceeded +15%, which puts the jump in the 99th percentile of all observations since 1950 – that’s robust! Ironically, the December decline of -9.1% was in the bottom 2% of monthly returns in the last 30 years. Together, that’s market volatility! When viewing this down/up market action – down -9.1% in December, and up +8.0% in January – a chart of market action would look much like a “V”. Historically, a review of market bottoms occurring over the past 75 years reveals a clear message – “V” shaped bottoms are quite rare, particularly the deeper, more severe the correction. Most often, rebounds from a sharp selloff take the form of a “W” – down, then up, then down to retest the low, and finally back upward moving to recapture prior market highs and/or advance beyond. Following the structural damage that occurred in December, we expect more time is needed to complete the repair. Recovery is a process, requiring price, time, and sentiment. The recent price action was corrective; a pause that refreshes valuations from being stretched too high. Time,…that’s more difficult to offer ideas around. Generally, market recoveries take months, not weeks. And sentiment – investor attitude toward risk – is more pessimistic than last year, wherein fewer investors have expectations for higher market values. Investors are uncertain because of market volatility, politics, and the global economic growth outlook; not to forget, this Bull market arguably remains the least “loved”, least believed-in Bull of all time. The current Bull market, which we believe is still underway even after the recent correction, probably will run longer. It is admittedly already the longest running bull of all time and presently the second strongest in history. Its run is far from a smooth ride, however. 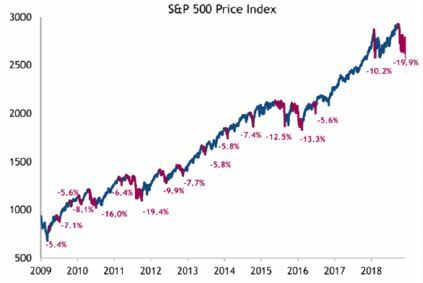 The S&P500 experienced 17 pullbacks of at least 5% since March 2009, with six of them being more than 10% (see chart to right). What ideas support the perspective this Bull can run further? The powerful rebound (99th percentile historically), provides a very strong signal that leads to above average returns +3, +6, and +12 months forward. In the short term, returns over the next month or so may pause and/or retest some; normal action following strong rebounds. Valuation is again a positive for investors, offering the ability to invest cash at cheaper values than existed in September 2018 (recent market high). Also, valuation is attractive in the context that interest rates are 2.7%, down from over 3.1% in December. And the real rate (interest rate above inflation) remains only +0.25%; not near +2.0% above inflation which often triggers recessions. US economic growth is still on a solid foundation, driven by a solid labor environment. The US economy is moderating from 2018, as tax reform provided more comparative benefit last year than it will in 2019. Biggest threats to the economic backdrop are starting to fade one by one – the Fed is “watching economic data” before raising interest rates further (too fast or too much); and tariff talk with China will progress (represents biggest risk to domestic and global economic growth). Remember, the interest rate that the economy can take remains higher than the rate financial markets are comfortable with. Global growth is weaker – Italy may be in a recession; Germany, France, Canada and China are all slowing. This presents a fear for many investors who believe this will lead to a recession in the US. Looking back through the 1970’s reveals that the US never followed the rest of the world into recession. The US always leads. Monetary stimulus is over; fiscal policy stimulus is on the global horizon. Foreign governments recognize there is a race for capital to stimulate growth. Foreign governments will likely initiate fiscal stimulus (tax cuts and spending) to boost economic growth (just like US did in 2017). Overall, the risk-reward profile of the market seems favorable for further stock market advance and continued opportunity to grow client portfolio values. The recent market correction and rebound provided us with the opportunity to rebalance portfolios. Our current portfolio strategy is less aggressive than if the bull market was just starting. We utilize a diversified mix of no-load mutual funds and ETFs (exchange traded funds) – together they create a portfolio risk structure focused on cheaper valuation and quality. IF the market remains troubled, current portfolio structure should protect portfolio drawdown. Yet, we are attempting to retain stock and bond exposures that will grow portfolio values as the Bull market continues. Client portfolios still hold some cash to invest; trades are prepared to “go” as/if a short-term market pause develops – as the market moves from the recent “V” shaped rebound to “W” shaped action, discussed earlier. Political and tariff debates will likely provide some near term “news noise” that will keep market volatility stirred, and allow the market repair process to complete (it takes months, not weeks). For January, we can thank the Fed for the surge! We are excited to announce Jordan Acer, CFP, CIMA joining Nvest Wealth Strategies. Most recently serving as the Director of Financial Planning for an independent wealth management firm in Columbus, he is highly passionate about meeting and serving people. We are excited with the experience he brings, and believe he will be a strong addition to our team and the service we offer to clients. You can learn more about Jordan in the “About Us” section of our website. Please join us in welcoming Jordan.